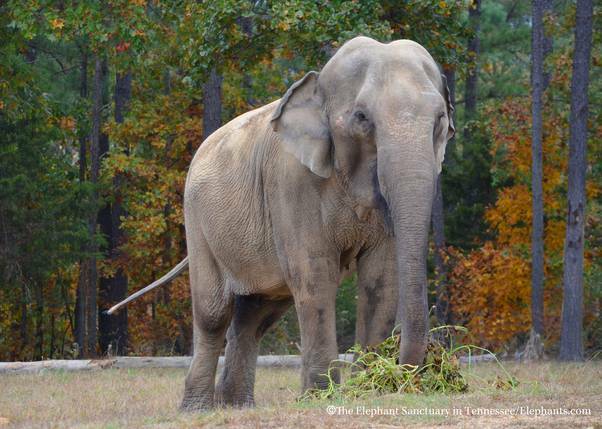 January 26, 2016, is the 16th Anniversary of Sissy’s retirement to The Elephant Sanctuary. Born wild in Thailand, Sissy was captured at a very young age and shipped to the U.S. Sissy spent her life on exhibit until she retired to The Elephant Sanctuary in 2000. Sissy now spends her time exploring the Asian Habitat with Winkie, her closest companion. She was on exhibit at Six Flags Over Texas amusement park in the late 60s before being moved to the Frank Buck Zoo in Gainesville, TX to replace the zoo's previous elephant, "Gerry," who had recently passed away. Now known as "Gerry II," Sissy spent the next three decades as the focal point of the zoo, even surviving a record flood, submerged for a day and a half, with her trunk above water allowing her to breathe. After a tragic incident involving the death of a zookeeper, Sissy was moved to the Houston Zoo and then to The El Paso Zoo. Sissy's harsh treatment at the hands of her new keepers was videotaped and leaked to the local press. Please read El Paso Elephant Beating from January 2000 for extensive background information. The El Paso community decided it was time for Sissy to retire, and charges were filed against the zoo by the USDA for violations of the Animal Welfare act. Sissy was on her way to The Sanctuary. Sissy arrived to join the herd of Tarra, Bunny, Shirley, Jenny, and Barbara. Reserved and cautious at first, Sissy soon began to venture farther out into the habitat, even socializing with the others. After several weeks, Sissy was even seen lying down in the habitat…incredible news, given that Sissy's previous keepers hadn't observed her lying down on her own in years. A few months later, Winkie arrived, and the two became fast friends. Sixteen years later, they still are. 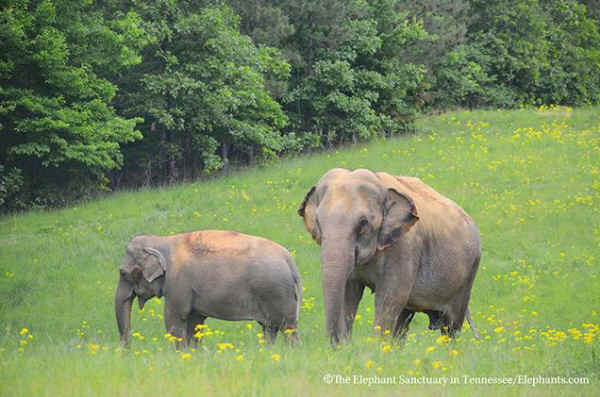 Winkie and Sissy both came to The Sanctuary with reputations as "anti-social," elephants that would not be able to interact well with others. Their relationship and their place in the Asian elephant herd indicates otherwise. The Sanctuary EleCams have recorded Sissy (and Winkie) splashing and swimming in the ponds located in the Asia habitat, even in the rain, a stark contrast to the elephant who was reported to show signs of anxiety and fear around water following her experience in Texas. Last year, for the first time, Sissy allowed Caregivers to give her a "shower" with the hose, a favorite activity of the other elephants. The Sanctuary's Protected Contact (PC) management and training program has allowed Winkie to interact with Care and Veterinary Staff in ways that don't intrude on her personal space, and she has made great strides in being more comfortable and at ease when receiving foot care treatments and other necessary attention.